The challenges facing our societies and our planet can be daunting, but your actions can truly make a difference. Whether you have a project in mind, or just a lot of questions, there are many ways for you to get involved with sustainability at McGill. Check out the opportunities below, stay up to date on sustainability happenings at McGill via our Facebook, Twitter and Instagram, and don't forget to sign up to receive our monthly e-newsletter. 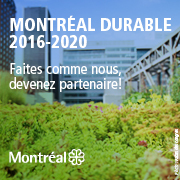 Have an exciting idea for a sustainability-related project at McGill? Lean how to orchestrate events at McGill that are good for people, the planet, and your pocketbook. Make your workplace certifiably sustainable. Discover an extensive network of student and community groups working on all aspects of sustainability. Engage with the gardening community and learn about sustainable food and urban agriculture. Use the University as a Living Lab and explore sustainability challenges, all while getting academic credit. Increase your leadership skills so you can supercharge the campaigns, clubs, and projects that you love. Help promote sustainability on campus by spreading the word about McGill’s Sustainability Projects Fund.